Cuddling is one of the greatest charms of the elderly ferret. While each ferret is different, many will become the cherished “lap rat” as they age. How many young ferrets will do THAT? The older he or she gets, the less trouble your ferret will cause. And you may never have a sock become Missing In Action in the few seconds between pulling it out of a drawer and pulling it on your foot. They may be old, but they’re still ferrets! I use flat newspapers for litter– if the animal is very old, placing paper toweling on top gives them more leverage. Be forgiving of your oldtimer; they can’t help their “mistakes,” and we can only hope if we become incontinent and old, someone will treat us with similar patience and kindness. Elderly ferrets become set in their ways. “An older ferret is grateful for what you do for them,” according to Salafia. For all the myths about “bonding with babies” that people entertain, it’s my experience that no ferret will bond closer to you than an older one for whom you care. Elderly ferrets often make a number of adorable little sounds. Like some human old ladies, ferret old ladies sometimes have quite a talkative streak. Elderly ferrets can be a lot of extra work. Ann Salafia spends far more time with her older ferrets than with her younger ones. I can never leave home for more than eight hours without having a volunteer or sitter come in to feed ill ferrets– and there were times, with a particularly ill animal, when one had to be fed every 4 hours! The joys– and hardships– of living with a furry senior citizen. Young ferrets may play upset and too rough the old ones. Another quiet ferret can give them the companionship many crave, as well as providing a warm sleep buddy. Even ferrets that actively dislike others are, I believe, better off with nearby company. Your vet should be carefully chosen. 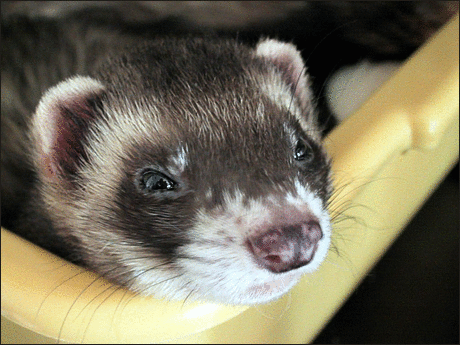 Your veterinarian should be knowledgeable about common diseases found in aging ferrets. When a ferret is 4 years or older, they should be seen by a veterinarian at least twice a year, to help catch any developing illness early. I can’t emphasize enough how important YOUR knowledge and commitment is to help ease your pet into a comfortable old age. Your ferret may not have a particular problem right now, eventually, they will become ill, and this information will be invaluable. 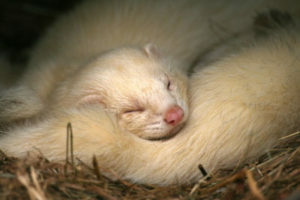 Levy mentions that older ferrets are far more sensitive to heat and cold. She also mentions that natural light is wonderful for all ferrets, not just elderly ones. “The ferrets go right to them,” she says, “as if they can feel the difference.”. Lying on the floor, in a shaft of sunlight, was a thin, sparsely furred little form. Six-year-old Bear was perfectly happy. Such is the nerve-wracking moments you may experience as the owner of an elderly ferret. It is very difficult on an elderly ferret to lose his or her home or be abandoned by their owner. They look confused and so sad when a ferret over 5 enters the shelter. Worse, any underlying illness they might have often erupted out of their distress and a previously healthy animal becomes ill. While you’re at it, make sure those rugs are washable! An older animal’s weaker hindquarters may make it very difficult to stand upright when eliminating. It can be cut smaller if needed and cleans well in your washing machine. Their skin, especially if they’ve lost fur, may become dryer and more sensitive. They may go blind or become hard of hearing. Between the ages of 4 to 6 is when you are most likely to see serious illnesses, like adrenal disease, insulinoma, or heart disease, develop. Warmth, light, and cleanliness are just as important to an old ferret as it is to an older human. An elderly animal can’t tell you when they are uncomfortable– YOU must think about their comfort. The monetary expense of caring for an elderly ferret can be hard. While a ferret’s medical conditions are rarely as expensive as some other pet illnesses, the bills can add up. (Most pet insurance plans do not cover ferrets.). Experts determine a ferret’s age by looking carefully at their two long, upper canine teeth. A ferret under 1 year has bright, solid white canine teeth. If you can, compare your ferret’s teeth to another ferret of whose age you are sure, and you will see the differences. Elderly ferrets can be gentle and sweet beyond belief. A friend who used to run a ferret shelter once had someone call and want to “trade” an old ferret for two young ones! Ann Salafia, Carol Levy, and I ALL agree– no matter how much it may cost you, caring for your elderly ferret will be repaid many times over. An elderly ferret’s level of energy is hugely different from a kit. At the Ferret Association of Connecticut shelter, we have two separate shelter rooms. One is for young animals. You may need to arrange their cage so everything the oldie needs is on the ground floor, and make sure it is easy to enter. Look for very low baskets that are a little “scratchy”– an older animal may have trouble scratching an itch, and something they can rub against feels great. Throw rugs will help them walk steadily, and don’t put too much distance between those important food, sleep, and litter spots. A ferret is elderly at 6 years of age. What if you don’t know how old you ferret is? There are definite physical differences between an older ferret and a youngster. An older ferret sleeps far more and plays for a much shorter period of time. He or she may sleep almost all the time when a ferret becomes very old. Elderly ferrets lose muscle tone and may feel frail when you lift them. She notes, however, that she still wouldn’t dare put a plant on the floor– not a plant she wanted to keep, anyway! If you can, compare your ferret’s teeth to another ferret of whose age you are sure, and you will see the differences. She also mentions that natural light is wonderful for all ferrets, not just elderly ones. Elderly ferrets become set in their ways. 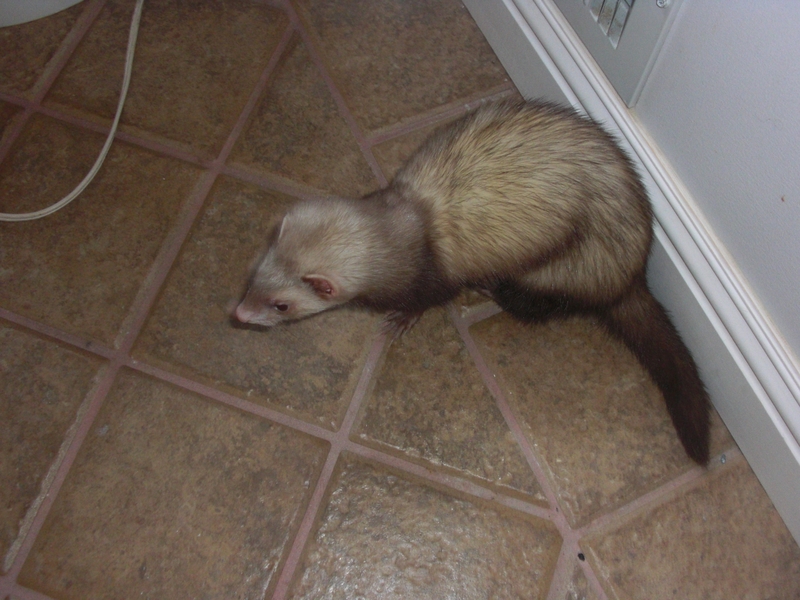 A friend who used to run a ferret shelter once had someone call and want to “trade” an old ferret for two young ones! 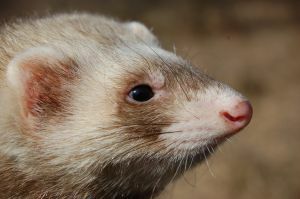 There are experienced owners who are “hooked” on older ferrets. They are brave and wonderful people– but they also know that older ferrets can be the very best of all.